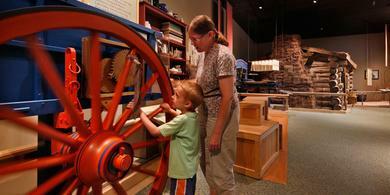 The reconstructed Kanesville Tabernacle and the visitors’ center in Council Bluffs, Iowa, is a historic site that commemorates the reorganization of the First Presidency in 1847. The visitors’ center also includes exhibits, historical artifacts, and a film about the Mormon Battalion, whose members enlisted about 10 miles south of the tabernacle. The Mormon Battalion was a group of about 500 Latter-day Saints who joined the United States Army in 1846, during the Mexican-American War, to help provide financial support for their families and other Mormon pioneers. For information about visiting the Kanesville Tabernacle, click or tap here. The original tabernacle was built in December 1847 in the Council Bluffs area of Iowa, which was later renamed Kanesville by the Latter-day Saints. On December 27, many Saints attended a meeting in the tabernacle during which they sustained Brigham Young as President of the Church and Heber C. Kimball and Willard Richards as counselors in the First Presidency. 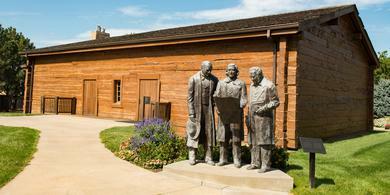 This marked the first time that the First Presidency had been organized since the deaths of Joseph and Hyrum Smith. The process of sustaining a new President helped establish the pattern of succession that continues in the Church today. The Mount Pisgah Monument is located in a small cemetery on the route of the Mormon Trail near the town of Thayer, Iowa. The cemetery likely includes as many as 150 Latter-day Saint pioneers who lived in the temporary settlement of Mount Pisgah between 1846 and 1852. The original grave markers are long gone, but a 12-foot-high obelisk memorializes those who died at Mount Pisgah and provides the names of 63 of those interred there. Interpretive markers and a reconstructed pioneer-era log cabin can be found in an adjacent state preserve. 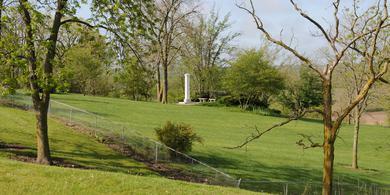 For information about visiting the Mount Pisgah Monument, click or tap here. Mount Pisgah was one of three temporary way stations Latter-day Saints established in central Iowa during the exodus from Nauvoo. Between 2,000 and 3,000 pioneers lived in Mount Pisgah at its height, and thousands more stopped there briefly on their way west. Although the community provided refuge and a chance for the Saints to rest and prepare for their journey further west, illness was rampant and the death rate was high. Mount Pisgah and the other settlements in central Iowa were completely abandoned in 1852, when Church leaders called Latter-day Saints still residing in the Midwest to gather to Utah.